Once a year, we close down the streets in Cleveland and roll out the brown carpet for the ever-eager Dawg Pound (aka the Cleveland Browns biggest fans). 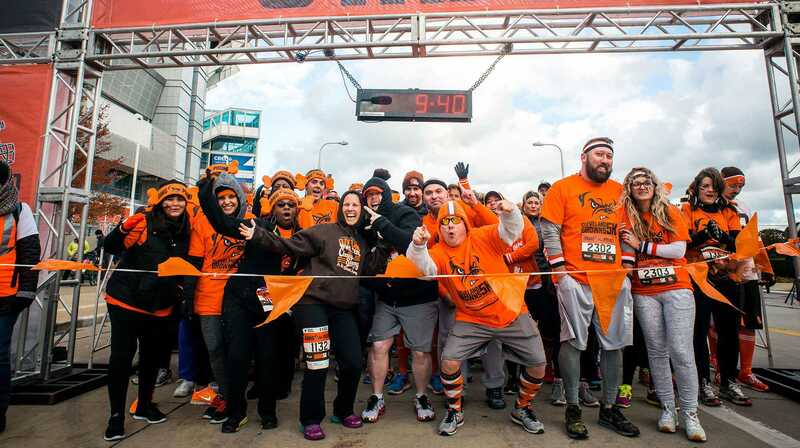 A race made to tap the Pound's team spirit, this collaboration with the Cleveland Browns takes place in late July – right before the start of the new season. In 2019, the course will finish on the field in FirstEnergy Stadium, followed by a celebratory tailgate on Dawg Pound Drive. For these fans, there is no better reward. As loyal a bunch as their canine moniker promises, the Dawg Pound arrive bearing teeth and wearing their finest orange and brown. Even Swagger, official live animal mascot of the Cleveland Browns, joins, posing for photo ops with spectators and participants alike. Then, there’s the actual swag. 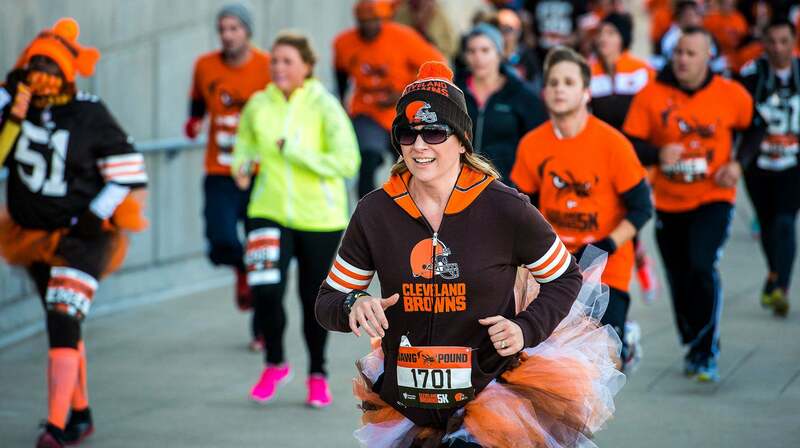 From bone-shaped headbands to custom-designed t-shirts and a one-of-a-kind finisher’s medal, runners walk away with Browns gear they’ll be proud to cheer in all season long. 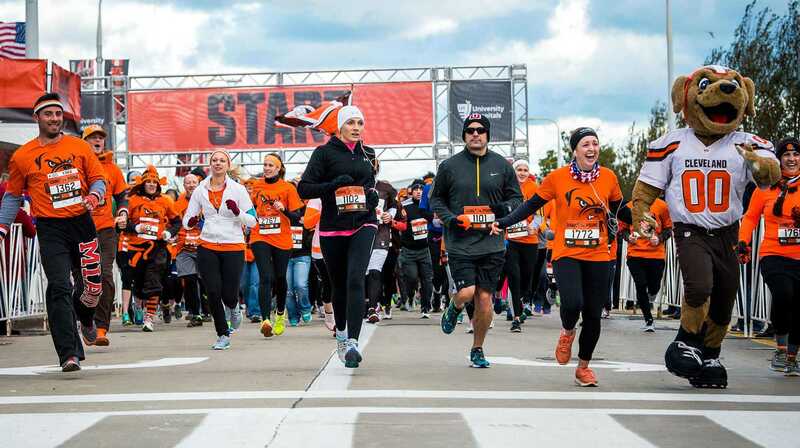 The race path starts and finishes at the Browns stadium, kicking up alongside the waves of Lake Erie and winding through multiple spirit-filled streets lined with friends and onlookers. First, runners encounter the Woof! Woof! Cheer Zone, followed by the Bad to the Bone Party Zone, the Dawg Pound Dance Party and certainly not least, the Believeland Cheer Zone. Waiting for all who finish is the Michelob Ultra Post-Race Party – part tailgate, all celebration. During this event’s inaugural year, we added 4,025 runners to the roster. As participant numbers increased in 2018, we anticipate a sold-out 2019 and can’t wait to run through FirstEnergy Stadium with the most passionate fans in the NFL, and the loudest barks this side of the lake. Run Mfg truly rallied the Dawg Pound. The energy was incredible – we can’t wait until next year.